PVC pipe is a truly remarkable material to work with. Although in our house, we have never gone beyond building forts covered in sheets (your kids will love having them around for that purpose, btw), but there is a lot more you can do with this versatile and easy to use pipe. Here is a wonderful idea for a piece that will make any blank wall pop! 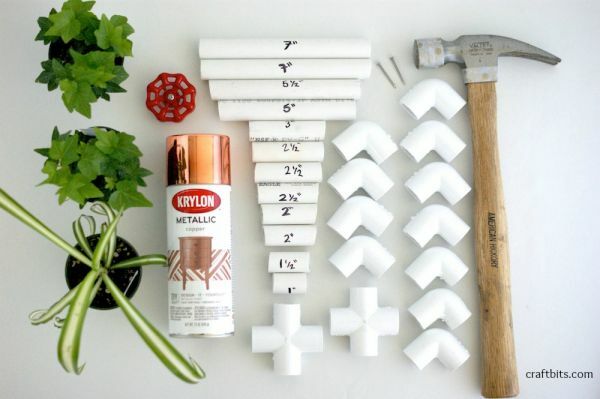 All that is really needed are PVC pieces and a few odds and ends you can easily get at a hardware store. This is an awesome idea, it would be a great conversations element and this would make a great housewarming gift already made or for the crafter to put together themselves. This is REALLY cool, but it would make more sense (and be more believable) if you put air ferns in the planter. These plants will only last a little while before they die. i would have liked to see the result… you messed up somehow.. IT would be nice to actually SEE the project so we Know what this is about, instead of your posts sending us to options to buy pages. Love it, but the pot size is very small. Plants need room to grow. Cute, but looks a little tedious for so little results!! Somebody needs to check out the price of PVC first. Each of those elbows are about $1.50 or more each, And she used 11 of them. The four ways ae even more, and PVC pipe is sold by the foot. DIY, but not cheap. Not sure where you get those prices from but at Home Depot the 1/2″ PVC elbows are .28 cents each, the 1/2″ PVC crosses are $1.32 and 1/2″ PVC pipe 10′ long is $2.01. Very cool! I would love to try this!! Nice! Might try this with much bigger PVC & fittings; then put small pots inside the elbows…maintain and/or change plants as needed. PVC elbows can be purchased in a bulk bag at most big box hardware stores (Home Depot/Lowe’s). That would keep the price down. This idea leads to other configurations that can do a lot more than hold plants! A planter for your wall, where the plants are in copper-painted pipes.